The outstanding achievements of primary and secondary school teachers of the Indonesian language were honoured at a dinner hosted by the Balai Bahasa Indonesia (‘Indonesian Language Pavilion’) in Canberra on 11 September 2015. 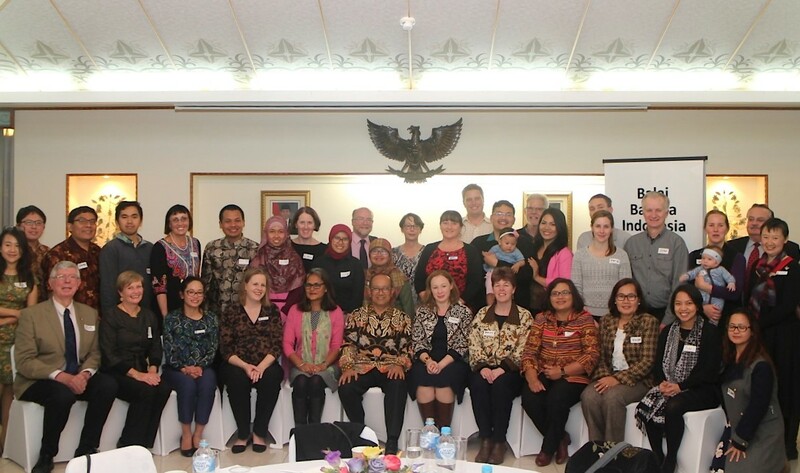 Around 40 past and present teachers exchanged classroom experiences teaching Indonesian at the function held at the Indonesian Embassy in Canberra. BBI (ACT) Chair and master of ceremonies for the dinner, Heath McMichael, told guests the challenge of promoting Indonesian language and culture in Australia is one not just for governments but for all community members who wanted to turn around the decline in the numbers of students taking up Asian languages. Addressing the dinner, Indonesian Ambassador to Australia, HE Mr Nadjib Riphat Kesoema, said the teaching of Indonesian in Australian schools added ballast to people-to-people relations between the two countries. BBI (ACT) hopes to recreate the warmth and camaraderie of the occasion at future events celebrating the efforts of teachers in line with its goal to promote Indonesian language and culture in the ACT and beyond.